One Size Reusable Diaper Cover (Adjusts SMALL-MEDIUM-LARGE in the same diaper) with One Natural Bamboo insert, Change only the pad every 2-5 hrs depending on the urination pattern and keep the same Diaper Cover for a second use for the day, after wiping the inner portion. If we buy it for new born, this will last till the baby crosses 3 years of age. Preferred by mothers mostly as an excellent day time diapering option for babies under 1 year. More mothers prefer to use a Bumberry Diaper Cover with natural Bamboo Insert as a solution for high skin sensitivity and allergic to disposables. The Bumberry Wet free Microfiber Insert is also an excellent option with the Bumberry diaper cover as the insert has a wet-free suede micro fleece fabric on the skin facing side of the insert that keeps the baby bottom dry. 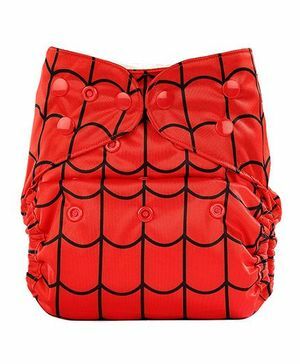 Please check out for Bumberry Pocket Style Diaper as an excellent overnight diapering solution and any-time diapering solution for babies over one year of age. Bumberry reusable one-size cover diaper with 1 sensitive low absorbency bamboo insert for babies with sensitive skin for ages 3 months to 3 years. Note: The color of the snap buttons vary. "not happy.. waste of money!!" the insert gets completely wet in one pee only.. baby feels uncomfortable.. cover style cloth diaper not recommended..
Cover quality is good but insert is not feeling dry to my baby. We have to change the insert after one pee. This insert should come with pocket diaper instead of diaper cover. the product is nice but the insert takes lot of time to dry so not recommended during rainy season.